While Exchange server meets crashes, internal service failure or gets dirty shutdown then corruption of public folders (Pub.EDB file) occurs by default. After corruption it’s definitely not possible to read access or open shared data i.e. stored inside. After corruption users always faces many errors messages and cannot mount Pub.EDB file. Such catastrophic situations lead only to use automated solution for Exchange 2003, 2007 & Exchange 2010 public folder repair. In these situations Log Files or Recovery Storage Group are also not helpful. In structured format export entire Public folder (Pub.EDB) into Outlook PST file format without losing any data. Areas where Public Folder (Pub.EDB) Repair Utility Works Successfully!! Corrupted Pub.EDB Fails to Mount: Apply the software when pub.EDB does not mount. Here, utility can repair exchange 2007 public folder database as well as recover 2007 and 2010 database and then export into PST file. Move Pub.EDB from Old to New Server: The highly efficient tool handles problems encountered while moving old server to new server. This Pub.EDB Converter can mount public folder database of Exchange 2003, 2007 and 2010 into Exchange 2007, 2010 and 2013. Support for All Editions: Firstly repair Exchange public folder database including 2003, 2010, 2013 & 2007 editions as well. 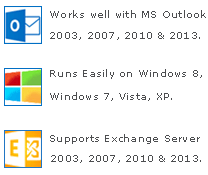 Download the multi-functional tool for Exchange 2010, 2007 and Exchange 2003 Public folder repair supporting all server editions. Also the application works without Exchange server. So after seeing so many benefits, get this automated application right now.